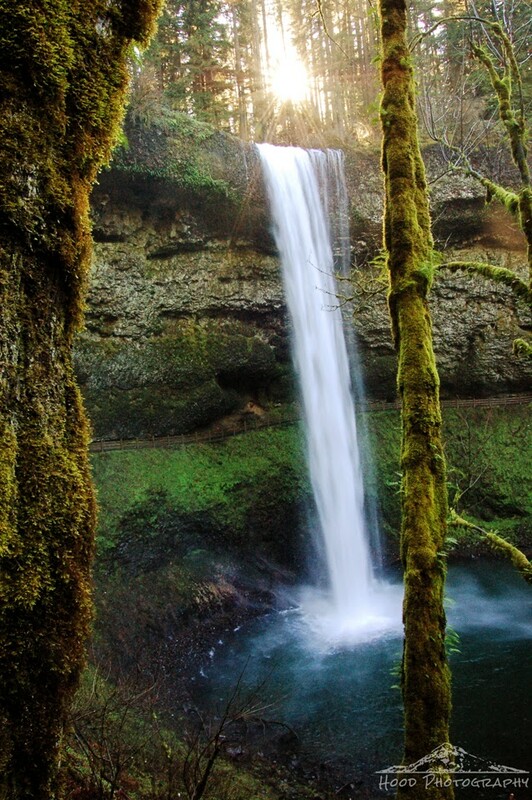 Last week we took a drive south to Silver Falls State Park. We ended up going on a weekday, which I highly recommend. We arrived right around noon and there were only about 4 cars in the often times full parking lot. The sun was still behind the trees that line the top of the canyon in which 177 ft tall South Falls drops into. From the vantage point that I took this photo, you can continue down and behind the falls to the other side of the canyon. From there you take a footbridge back across South Fork Silver Creek below the falls and hike back up the trail to where you started. The entire loop is just short of a mile with a pretty steep elevation change for such a short distance. I am proud to say my future avid hiker son, who is now not quite 22 months old, did almost the entire walk himself! Oh, what a greatful waterfall and picture! Can't go wrong with a trip to this state park! The sun shining above the waterfall looks mighty familiar! :) My photo of Lower South Falls with a sunburst over it just won 2nd place in Pro Photo Supply's "photo of the year" contest! Beautiful waterfall and a lovely photo! Stunning photo! Beautiful place to get to hike!